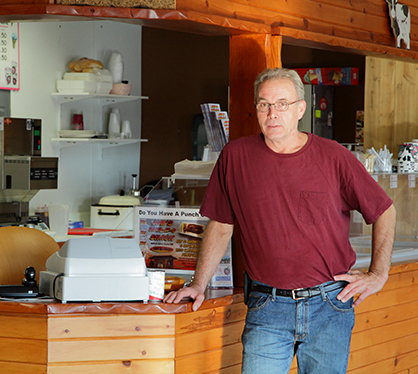 In 2005, after 30 years working in construction, Jim decided it was time for a change. He learned to smoke meats when he was young, starting with fish. Using fruitwoods, he smoked fish and meats for his family, and that hobby would become his business. There were no barbeque businesses in the area. Jim found a BBQ pit he liked, and it led him to looking at concessions stands. Ultimately, Jim would put his building experience to use and build his own. It took three months to get the shack built and the BBQ pit mounted on it. The first day was august 18th, 2005. They served pork and beef sandwiches and ribs, prepared on the pit right there on the trailer. 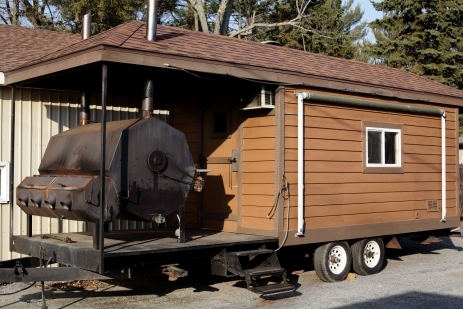 For the first two years, the BBQ shack on the trailer chased various events around the state, pumpkin fests to motorcycle rallies. After five and a half years, Jim decided to open a real restaurant where customers could come in, sit down, and eat in comfort. Now they had more room, and started serving ice cream as well. The first location was out of the way, but customers found it anyway, brought back again and again by excellent food they couldn't get anywhere else in town. After nine months, an opportunity for bigger, better location presented itself. The place needed to be completely renovated. Working with the owner, Jim once again put his construction experience to work and helped remodel the building to its present state.